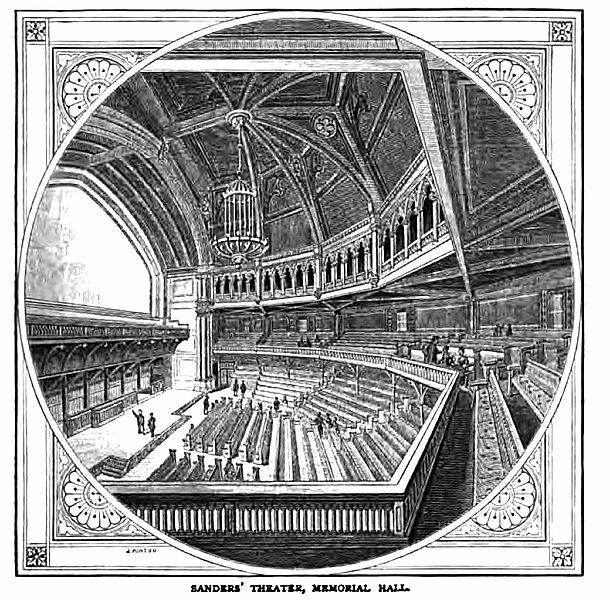 In just over two weeks, Odyssey Opera’s production of Jeanne d’Arc au bûcher (Joan of Arc at the Stake) will find its home in the halls of Harvard University, embraced by the beautiful architecture of the famous Sanders Theatre. While at its maximum capacity it can seat up to 1,000 people, its 180-degree design allows for an intimate experience for the audience, which is well suited for this production as the audience is invited to join Joan on her emotional journey, the moments before her execution. While it is known for its design and fantastic acoustics, and has been the used for a variety of events since it was constructed, Sanders Theatre was originally built as a lecture hall and meant the location for Harvard’s commencement ceremonies. However, once the university realized the quality of the acoustics and saw that it was suitable for more than just a lecture hall, it has been used for many musical and theatrical events. This is not the first time that Joan of Arc has made Sanders Theatre her home. Producers Jerome Kilty and Albert Marre brought an acclaimed production of George Bernard Shaw’s Saint Joan to Sanders Theatre after the Second World War. In 1956, The Cambridge Drama Festival, with the help of a foundation of Harvard graduates, presented Saint Joan, along with Henry V and The Beggar’s Opera, which starred Irish actress Siobhan Mckenna. We are excited to add our production to the list of Joan of Arc-inspired works to Sanders Theatre’s theatrical résumé. Before you enter Sanders Theatre on February 17th for our performance, take a moment to admire the stunning stained glass in the Memorial Hall Transept! Within the beautiful design of the North Transept Window, entitled “The Virtues Window”, was created by Donald MacDonald, you will see that he listed ten virtues; Hope, Patience, Authority, Discipline, Magnanimity, Constancy, Fortitude, Prudence, Probity, Temperance. The South Transept Window is entitled “Knight, St. Martin and the Beggar, Inscription, Sidney at Zutphen, Scholar” designed by Sarah Wyman Whitman. This window was constructed to honor those who gave their lives in the Civil War and “to commemorate the forces which inspired these heroes. Love of the University… and Love of Country.” This window also displays heroic virtues, illustrated by four cherubs holding tablets with the inscriptions for Love, Honor, Courage and Patience. These works of art are a perfect way to welcome our audience into a night celebrating a woman who embodies these virtues throughout her short but profound life. We are so excited for this upcoming production of Jeanne d’Arc au bûcher and the theatre will be filled to the rafters with talented artists! Shura Baryshnikov performing the title role and Brandon G. Green portraying Brother Dominic will be our guides in the emotional journey. The Odyssey Opera Orchestra and Chorus will be joined by The Harvard-Radcliffe Collegium Musicum and the Premier Choir of the Boston Children’s Chorus. It is not common for Sanders Theatre to be open to the public for viewing except for performances, so make sure to get your tickets and join us for this one night only event to experience this powerful piece in a theatre deserving of such a musical offering!